As featured on the For the Love podcast with Jen Hatmaker, Typology podcast with Ian Morgan Cron, and Sleeping At Last podcast with Ryan O’Neal. How to understand the ‘why’ behind your enneagram type. Chris Heuertz’ life was forever changed after he learned about the enneagram 15 years ago, and since then he has trained under some of the great living Enneagram masters including Father Richard Rohr, Russ Hudson, Marion Gilbert, and Helen Palmer. Today he leads enneagram workshops all over the world. Join Chris as he shows you how this ancient tool can help you awaken to the gifts God has given you, find freedom from your personal patterns of sin and fear, and grow in acceptance of your identity as you grow with God. The Sacred Enneagram is a trustworthy, richly insightful guide to finding yourself in the enneagram’s 9-type profiles, and applying this practical wisdom to transform your life. Far more than a personality test, author Chris Heuertz writes, the enneagram is a sacred map to the soul. The enneagram offers a bright path to cutting through the internal clutter and finding our way back to God and to our true identity as God created us. Chris’s own journey with the enneagram is an accessible introduction and exploration of how the enneagram can change your life, because to the extent that we are transformed, the world will be transformed. 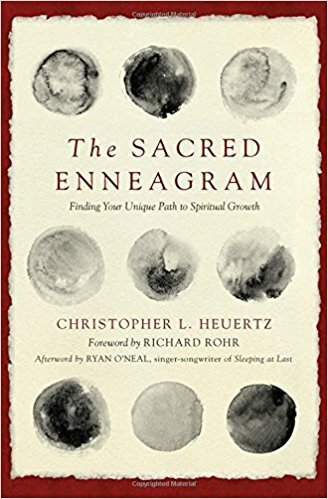 Heuertz, Christopher L. The Sacred Enneagram: Finding Your Unique Path to Spiritual Growth. Grand Rapids: Zondervan, 2017.